This webpage is for Educational Purposes ONLY. We do not encourage anyone to use pirated e-books. 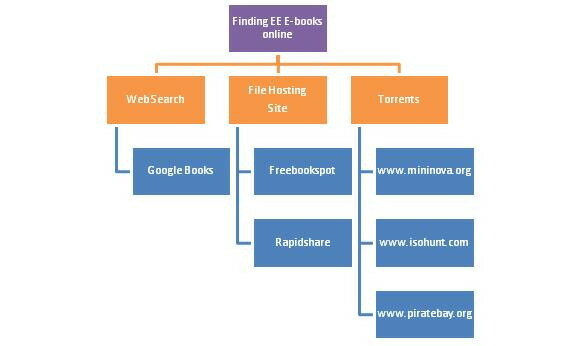 "How To Find EE E-books Online?" E-books can be read on personal computers, or on devices especially made for e-books called e-book devices. Latest mobile phones also support e-books. • Less space is required to store e-books, and hundreds or thousands of books may be stored on the same device. • People who have difficulty reading printed books can use the adjustment of text size and font to help in their reading. • An e-book reader costs more than one book but the electronic texts are cheaper than a normal book. • Text-to-speech software can be used to convert e-books to audio books. • E-books may allow animated images or multimedia clips to be embedded. There are many different sites that offer e-books. Some of them are free and some are not. Some of them are mentioned in detail below. Google books (a product of google) will our first stop in finding an e-book. Google does not sell e-books rather it searches the databases of websites and finds the e-book one is searching for. One can also view full contents of some e-books on Google. The authors of these e-books have entered in a partnership with google. Most of the e-books on google books are not free. 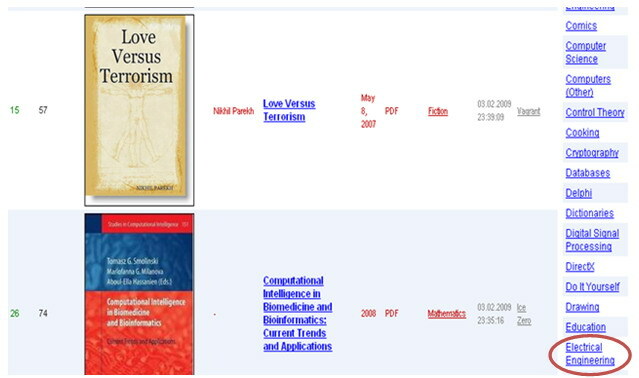 Google books can search the text of an e-book. Right now it can search through the full text of about seven million books. i. The first step is going to the address http://books.google.com. ii. On this site one can see categories like fiction and non-fiction. iii. EE e-books can be found under the non fiction heading. 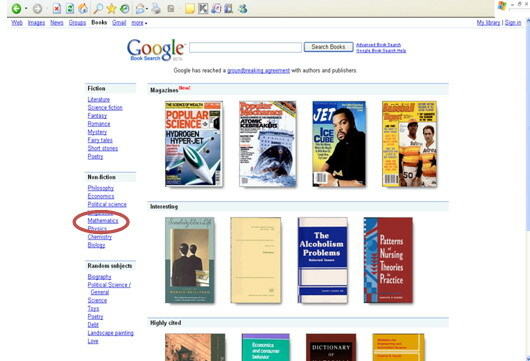 v. If one wants to find a particular book, he can use google search bar at the top of the screen. vi. One can view full contents of some e-books. These e-books are public e-books. vii. Most of the e-books can only be viewed after buying them online through a credit card. viii. On google books one also has the option to find an e-book by its author’s name, ISBN number and also by searching the contents of the e-book. ix. It also offers to find e-books by their Publication Date, Publisher and language. Freebookspot.org is a site that offers free EE e-books. One can search the site for the desired e-book and then download it. A brief description of the book is given. 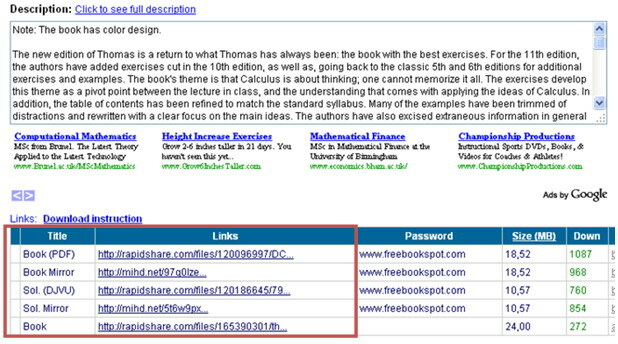 The E-books are hosted on rapidshare. Rapidshareis a one of the world largest file hosting sites. There is also an option to buy the e-book online. ii. On the home page of this site there is a frame to the right in which different categories of e-books are given. iii. In the categories one category is electrical engineering e-books. iv. Free e-books on EE are available in that category. 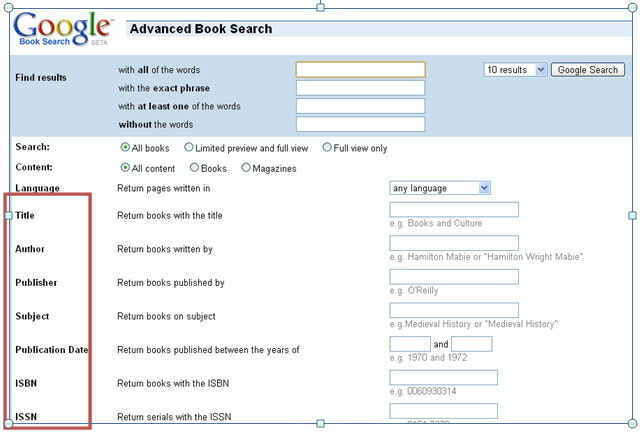 v. There is also an option to search the site for the desired e-book. vi. When one clicks on the desired e-book we get to know the format and the description of the e-book. vii. On the webpage where the description of the e-book is given there is link for downloading it. viii. This link takes the person to the site [*www.rapidshare.com www.rapidshare.com]. ix. On the rapid share site one has to wait for about 35 seconds and then the desired file starts downloading. Torrent is file extension used by a BitTorrent client and other peer-to-peer programs that use the BitTorrent protocol. BitTorrent is a protocol designed for transferring files. It is peer-to-peer in nature, as users connect to each other directly to send and receive portions of the file. There is also a central server (called a tracker) which coordinates the action of all such peers. The tracker only manages connections, it does not have any knowledge of the contents of the files being distributed, and therefore a large number of users can be supported with relatively limited tracker bandwidth. 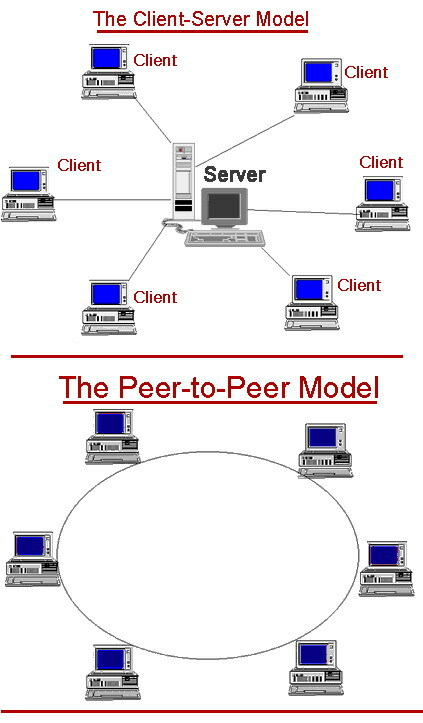 The most common method by which files are transferred on the Internet is the client-server model. A central server sends the entire file to each client that requests it. The main advantages of this method are that it's simple to set up. But it takes a great deal of bandwidth and server resources to distribute a large file. This is not a problem in torrent files. ii. On the site home page there is option labelled browse categories click on it. iii. In it select books. iv. In the books sections there are e-books, audio books and manuals. v. The manuals are in the form of solution manuals and student guides. vi. EE e-books can be found in the e-book section. vii. One can also search for an e-book using the search bar. viii. Once one has found the desired e-book clicking on it would open another page. x. Click on it and save the file. xi. The saved file is a torrent file. It requires a special program to run it. xiii. On the home page there is link saying “Get Bittorrent”, Click on it. xiv. Save the setup and run it. xv. Once the program has started, go to file option in the menu and select add torrent. xvi. Select the file you have downloaded. xvii. Once the e-book has been downloaded try to upload it so that other people can also use it. A Question arises about the legality of e-books found on the above mentioned sites. In the following paragraphs we will address these issues. Many of the books in Google Book Search come from authors and publishers who participate in their Partner Program. For the eBooks in the partner program the partners decide how much of the book is browsable it could be anywhere from a few sample pages to the whole book. If the book is in the public domain it means that it is out of copyright, one can page through the entire book and even download it and read it offline. But if the book is under copyright, and the publisher or author is not part of the Partner Program, only basic information about the book is shown. No files are hosted on freebookspot.org itself. The files are only indexed the same as in Google. This site merely indexes of other sites' contents. So the administrator cannot be held responsible for the contents of any linked sites or any link contained in a linked site. Furthermore it is stated on the site that all the material on the website is for Educational Purposes only. Rapidshare which is the 12 most visited website right now is facing different difficulties due to copyright laws. Rapidshare is a one click file hosting site. Its member can upload any kind of data and they also have the option to share the data with any one they want. This is creating copyright problems as its users are uploading and sharing material that is protected by copyright laws. Recently the music industry in Germany (GEMA) has secured a legal victory over Rapidshare. According to the rights holders, Rapidshare is going to have to stop its users from downloading copyrighted music tracks from its servers, or it could face the prospect of being shut down. If we look from the view point of rapid share Rapidshare it has always insisted that it cannot be held responsible for the actions of its users, because the users upload the files and share them. Rapidshare is only a file hosting site it doesn’t control what files are being uploaded or downloaded. Most of the torrents sites claim that they do not host any copyrighted material and if any such material is found it is removed at once. But by taking a look at different sites we see that they are full of copyrighted materials so their claim of not hosting any copyrighted material is false. So if a person resides in a country that has very strict copyright laws then he should avoid the torrent sites as they would be considered illegal in his country and the authorities can take action against him.